I am having major writers block in regards to a blog piece for the Squaw Creek/Poison Creek work project the weekend of the 18th. Nothing exciting happened at all. Nobody got bucked off, rolled on, stepped on, kicked, bit or required a medical evacuation. There were no injuries other than a few aching shoulders expected with the type of work we do. The only blood I saw the entire weekend was my own, and that didnt occur until the last few minutes before loading up and heading for home. I got so bored I decided to use my pocket knife to cut the witches knot out of Annies tail. I missed her tail and sliced my finger; hardly anything to write home about, let alone blog about. I considered making something up. Not a lie exactly  more of a fictional elaboration of the actual events to sort of spice things up. I might convince Rob to go along with some fantastic account of adventure and intrigue, Lou Ann, however, is a different story. Lou Ann insists on seeing that I remain grammatically correct and honest in my storytelling at all times. Programmers. We came, we cut and we conquered. Thats pretty much it in a nutshell. It makes for a fairly drab blog piece, doesnt it? 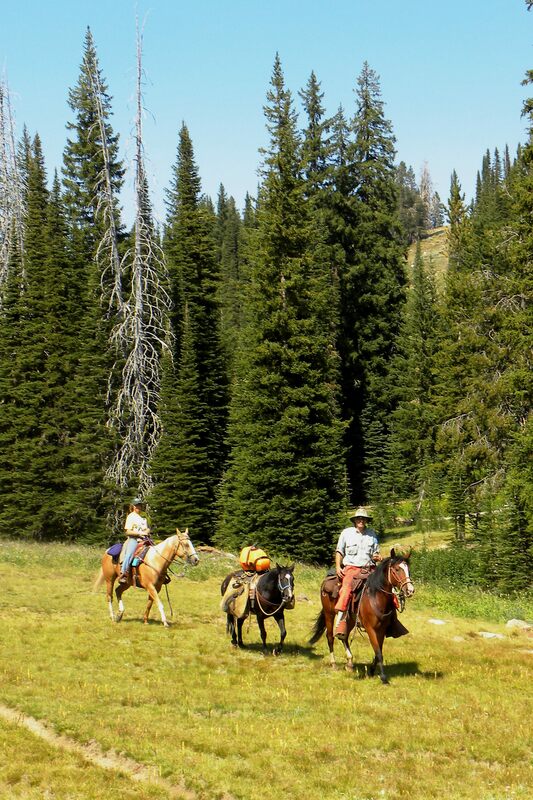 Actually, the previous weekend was much more interesting, but has nothing to do with Back Country Horseman and would be more appropriate for another blog. I had just ridden out of the Eagle Caps after spending the earlier part of the week following a band of hippies through the mountains. As I said, this story is best left for another blog  but I will say this: What happens on the mountain does not necessarily stay on the mountain. One word of advice  DO NOT eat dried fruit prepared by a hippy chic living without proper sanitation facilities  no matter how hungry you get. Jack had thrown a shoe sometime between the hippy excursion and home. I called every farrier I trusted within 100 miles without gain. I gathered all the old shoeing tools I could find, tossed in a handful of nails and picked up two size 0 front rims at D&B on my way through town. I can tack on a shoe in an emergency if I have to. I hoped I didnt have to. Completely ignoring Dave the GPS  I followed the directions from the web site to Squaw Creek campground. I opted to go the long way through Ola. Even with newly installed trailer brakes, bearings and two new trailer tires, I didnt feel up to four wheeling my way this weekend. It was just too easy. I pulled into the campground without making one wrong turn. At least it appeared to be the campground from the directions. Rob mentioned he would try to be there by noon and place a few signs. There were no signs and no Rob and it was coming on 3:30 PM. I temporarily high-lined Jack and Annie and parked my rig in an area easy to spot should anybody drive by, and waited. I wandered around the area checking it against the map. This had to be the right spot. Where was everyone? I hadnt brought any feed for the horses and there was not much graze where I had high-lined. I decided if nobody showed up in the next few hours, I would move the horses to graze and set up camp for the weekend, right spot or not. As it was, Rob pulled into camp several hours later. Jack and Annie would be glad to see the certified weed free hay and I was proud of my sense of direction for probably the first time in my life. Rob took a look at Jacks hoof and determined it would probably do more harm to tack on a shoe than to leave it as is. Jack has good, sound feet and they had grown out enough to give him plenty of hoof wall protection against the rocky terrain for one weekend. I brought along a pair of emergency barrier boots in case we were wrong. Lou Ann arrived just before dark. The three of us would make up the work crew for the weekend. I brought out a chicken broccoli casserole for dinner and the others tossed in various vittles to go along with it. Still feeling the effects of the previous weekends hippy adventure, I turned in early. Saturday morning the three of us hit the trail bright and early. It was an experience in mounting/dismounting. A deadfall lay across the trail every 100 yards or less. Toward the top of the trail, one of the saws threw a bearing and seized up. The remaining saw was in need of sharpening and fast became worthless. We soon had nothing more to cut trees with than a paper weight and a spoon. for no other reason than because he can. Rob prepared chicken with a mushroom sauce and wild rice. Lou Ann had made green beans to die for and I whipped up a Dutch Oven peach cobbler. I had brought the wrong Dutch oven for the job. The lid was the rounded, burry in the ground variety, and I needed a lid with a lip to hold the briquettes in place. Rob scrounged through his DO supplies and came up with an acceptable lid that would make do. That is pretty much how it goes on these trips  nobody expects perfection and everyone pitches in and makes do where needed. Aside from a little ash around the edges  dinner was served. Poison Creek trail on Sunday would be cut rather short. A tangled mass of a dozen or more blow-downs blocked the trail shortly after the bridge crossing. We split up in three different directions to scout out an alternate route before coming up empty handed. We made the determination that Poison Creek would have to remain closed for the time being. We had neither the saws nor the man/girl power to tackle this one today. Rob would contact the FS and have them flag a route at their discretion. Squaw Butte would open Poison Creek on another day. Who has my chocolate chip cookies? Rob? Oh, that’s right! Lou Ann made cookies! I forgot to mention them. They were really good and deserve a blog catagory of their own.